If you live along the Eastern seaboard, you may have noticed that it has been a bit steamy of late. In anticipation of the heat, I worked a couple of my favorite main-dish salads into our meal plan for the week. Since I already had a full day of cooking planned on Monday (and was already working up a sweat), I did a bit of prep work for these salads in advance, which meant they came together quickly and easily on the nights I served them, requiring little more than chopping and assembly to get them on the table. First up, Tuesday night’s Cobb salad, made with chunks of grilled-in-advance chicken, hard boiled egg, avocado, bacon, blue cheese, chives, and tomato on a bed of crunchy lettuce. I added some chunks of cucumber and radish to the mix – not traditional, but cool and refreshing (and who doesn’t love extra vegetables this time of year). On Wednesday night, after a snack of thinly sliced radishes on sea salted butter-ed bread, I assembled another one of our favorites, a Niçoise-style salad loaded with blanched haricots verts and true “new” potatoes (both from Wishing Stone Farm), cucumbers and tomatoes from Kimball Fruit Farm, more hard boiled eggs, and a few pantry staples: Nicoise olives, capers, and great canned tuna and anchovies. I love <a href="serving this on a big platter so that diners can help themselves to as much of the various components as they want, and though you can certainly cook your potatoes ahead of time, I prefer to boil them soon before serving, then toss them with a bit of my shallot-studded vinaigrette so they can soak up the flavor. These two salads are a couple of my favorite meals to help beat the heat – just add some chilled rosé, serve, and smile. I think I might actually eat salads if they looked like these! You have inspired me. Plus, I also live on the east coast and am getting pummeled with crazy heat. 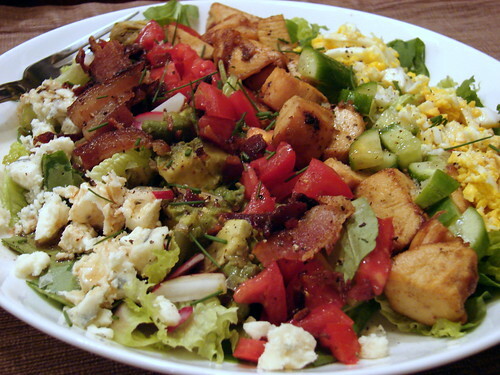 I’ve had that cobb salad on my mind ever since you mentioned it. Looks like a work of art. Now, about those radish and sea salted butter snacks. 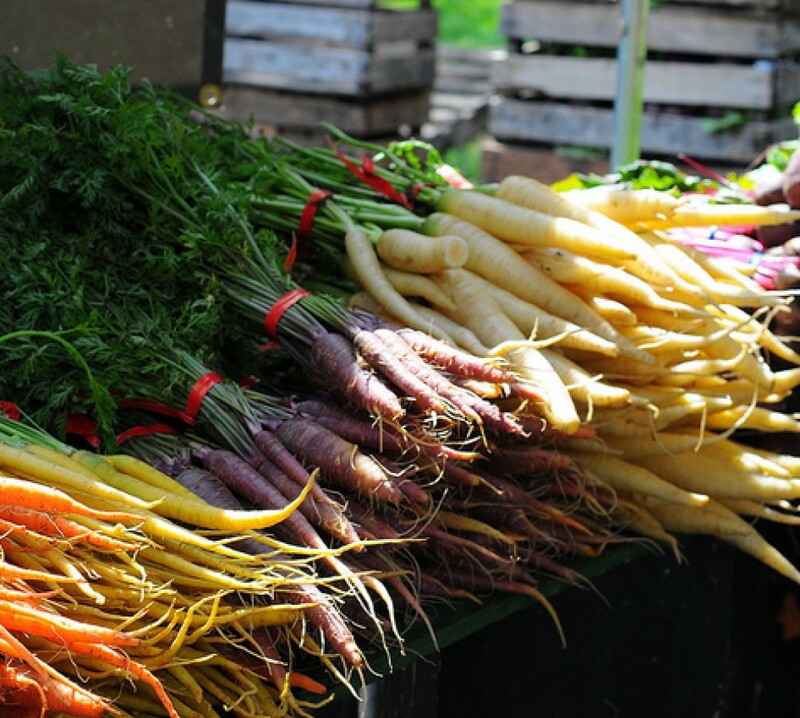 I’m definitely getting a bunch at the market this weekend. 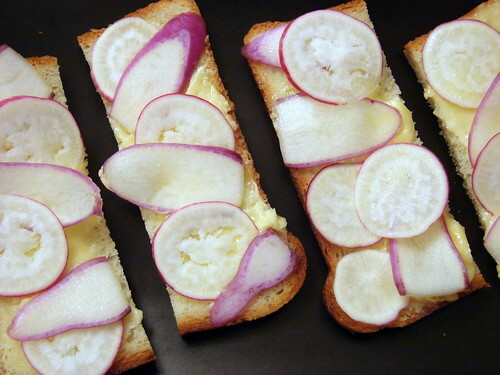 radish toast looks delicious!! and I agree with you about big, fresh, cold salads to accompany chilled wine during hot summer months…much needed! 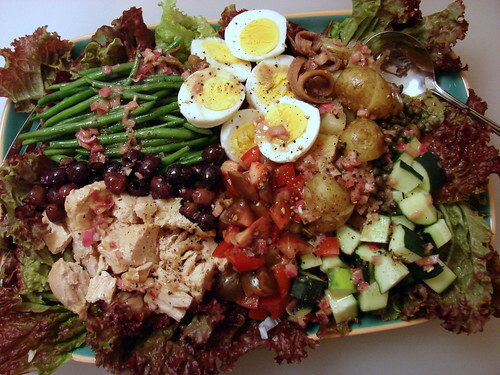 The Nicoise looks fabulous! Living in Southern California we have been expecting our usual heatwave. But, it’s been soooooo mild. Still sort of soup weather! But, I know the heats coming! So, I’m going to keep these delicious salads in mind! Now this is my kind of salad! Wanna transport it to me for our Bastille Day celebration this evening? !